This native orchid is Goodyera oblongifolia, known as the Western Rattlesnake Plantain or Giant Rattlesnake Orchid. 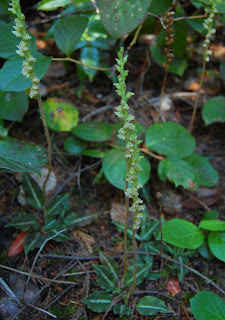 It has a widespread range across North America, and although endangered in Maine, it's common in the Pacific Northwest. Here are a few thriving among salal on Whidbey Island, near Deception Pass. They don't range up the mountainside as high as Western Coralroot.